The new fund will be used for education and to expand habitat for the migrating butterflies, which have suffered a 90 percent population decrease in recent years. That is due mostly to the dwindling supply of milkweed, the plant where the butterflies lay their eggs and the main food source for monarch caterpillars. The Fish and Wildlife Service gave $1.2 million to jumpstart the National Fish and Wildlife Foundation Monarch Conservation Fund, which will be supplemented with other donations. The government is also putting up $2 million for other monarch butterfly conservation efforts across the country. Monarchs take several generations to migrate to the northern United States and Canada, laying eggs along the way. They take only one generation to migrate south, back to wintering grounds in Mexico and Southern California. 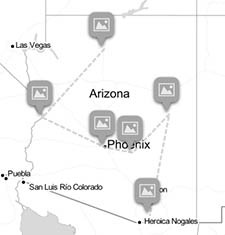 Arizonans often spot western monarchs during their migration back to California for the winter. 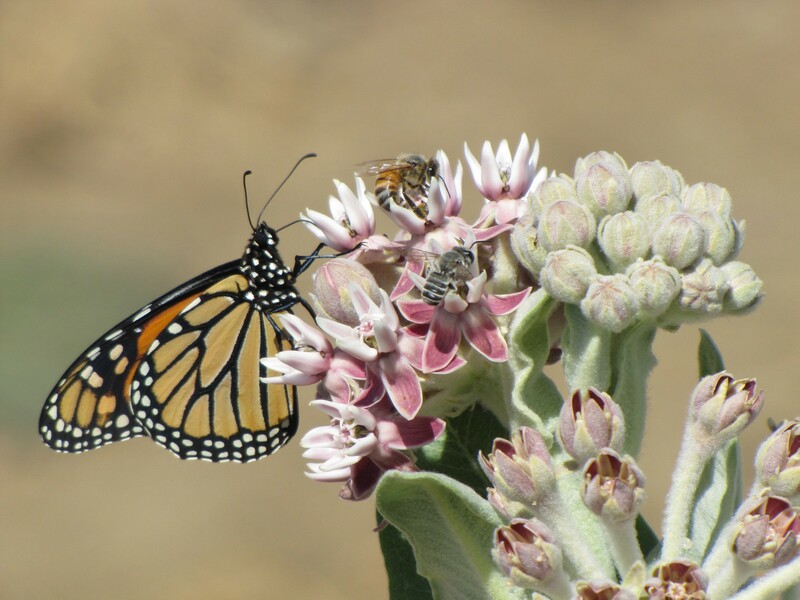 Tierra Curry, senior scientist from the Tucson-based Center for Biological Diversity, said Arizonans can help save the western monarch population by planting milkweed in their backyard. “Especially in the desert environment, those backyard gardens are going to be really important,” Curry said. 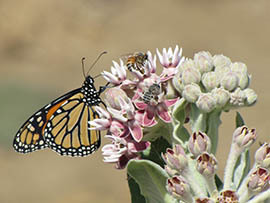 A large portion of the new funding for conservation focuses on milkweed production. Ashe said his agency will work with the National Wildlife Federation to reach the public and encourage Americans to become part of the solution. Collin O’Mara, president and CEO of the National Wildlife Federation, said people in all corners of the country can help. “Whether you have a postage stamp in a very dense urban area or even just a small part of a rooftop garden in New York City or a sprawling estate somewhere in the South – we need all of those areas,” O’Mara said. The National Fish and Wildlife Foundation, which will oversee the new monarch conservation fund, will solicit proposals to restore habitat, educate the public and enhance production of native plants. It will also leverage the $1.2 million to create public and private partnerships, aiming to match the initial funding with other donations, said Lila Helms, executive vice president of external affairs. 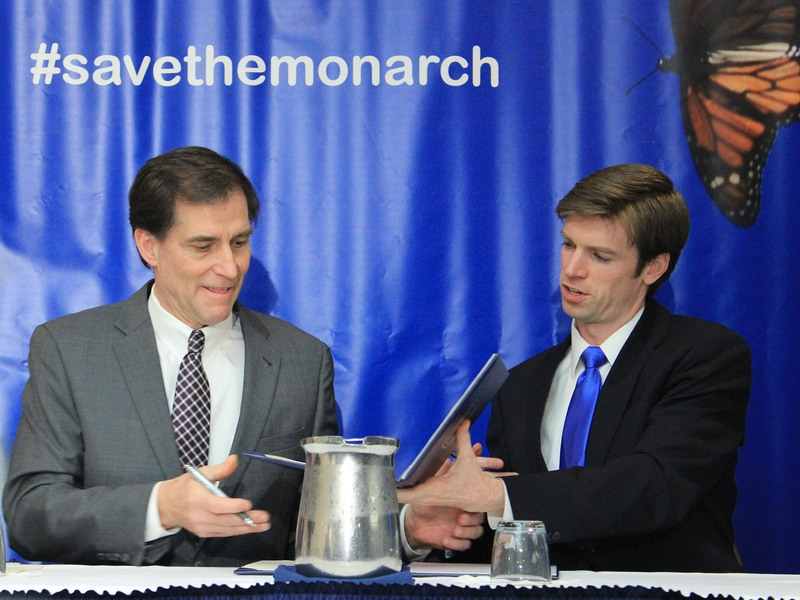 “This fund will be the first dedicated source of funding for projects working to conserve monarchs,” Helms said. Curry called it a “great first step” – but said more needs to be done. The Center for Biological Diversity was one of several organizations that petitioned the federal government last year to protect the monarchs under the Endangered Species Act. “I think the monarchs still need Endangered Species Act protection because the decline has been so great and the population size that is needed to be resilient to threats is so large that this is a drop in the bucket,” Curry said. The Tucson-based Center for Biological Diversity was one of groups that petitioned the federal government to protect monarch butterflies as a threatened species under the Endangered Species Act. U.S. 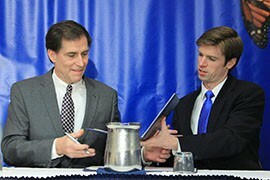 Fish and Wildlife Service Director Dan Ashe, left, and National Wildlife Federation President Collin O'Mara sign an agreement to collaborate on monarch butterfly conservation.